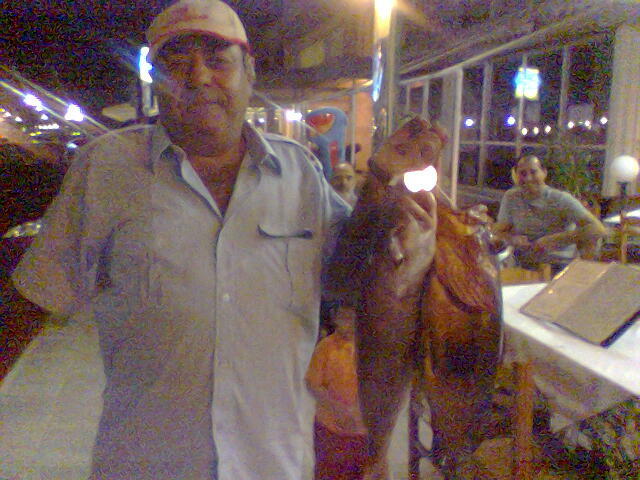 I took this photo on my mobile phone on holiday a couple of years ago in 2006 when the man in the image posed for it whilst carrying some freshly caught fish. We don't remember any children being there at the time the photo was taken, the fisherman was holding three fish yet this mysterious little boy seems to have taken the place of one of the fish as only two are now visible; the light below his hand was from a lamp in the taverna and I think the green pattern behind the man on the right was from a plant. We only looked at the photo the following morning and it made us go cold, it is very odd how the boy's arm appears to be in front of the man doesn't it? And how you can see the faces of the men behind the boy but not his. I think it is quite sad as I wonder if he was a child lost at sea. I shall leave it with you; hope to hear from you soon if you can shed any more light on it. Supported Living Outreach Team Leader"